The top executive at the country’s pre-eminent health care quality organization is being paid hundreds of thousands of dollars by two large medical companies that have a stake in the group’s work. 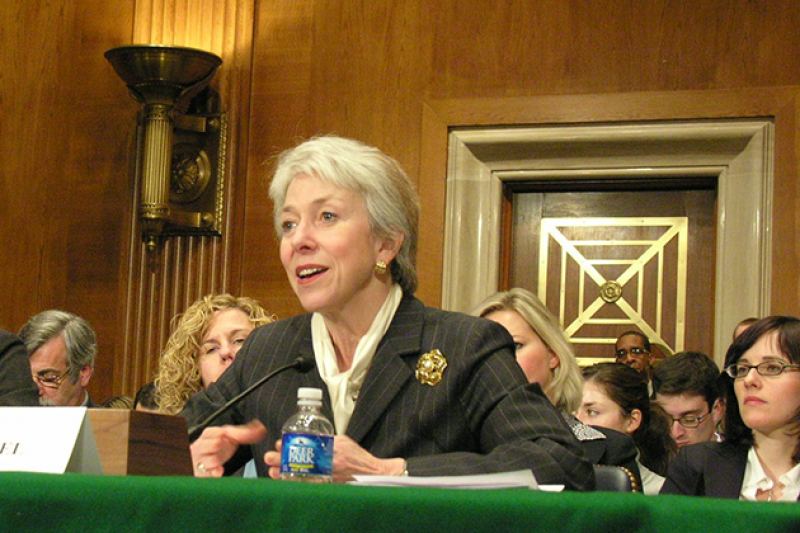 The payments to Dr. Christine Cassel raise new conflict-of-interest concerns at the National Quality Forum, which endorses benchmarks that Medicare uses to compensate hospitals based on performance. As ProPublica recently reported, the Quality Forum is reviewing its conflict-of-interest policies after being stung by allegations that the former co-chair of one of its endorsement committees had accepted kickbacks to help a drugmaker win favorable treatment. Cassel received about $235,000 in compensation and stock last year as a board member for Premier Inc., a North Carolina company that says it provides group purchasing and performance improvement consulting for an alliance of 2,900 hospitals and thousands of nursing facilities and other providers. Cassel also was paid $189,000 as a board member for the Kaiser Foundation Health Plans and Hospitals in 2012, Quality Forum officials confirmed to ProPublica. Kaiser’s tax forms are not available for 2013, but they show that in 2010 and 2011 Cassel received a total of $357,125. Cassel, who declined to be interviewed, took over as chief executive officer last summer after a decade as president and CEO of the American Board of Internal Medicine. She also sits on the President’s Council of Advisors on Science and Technology and has been active with the Institute of Medicine. Quality Forum officials would not say how much Cassel receives to run the Quality Forum, but her predecessor was paid about $525,000 in salary and other compensation in 2011, tax documents show. The group's chairwoman, Helen Darling, said in an email that the board was “fully aware” of Cassel’s outside compensation when she was hired in December 2012. Darling, president of the National Business Group on Health, initially agreed to an interview but did not respond to follow-up contacts. Spokeswoman Ann Greiner said the board got a legal opinion and discussed it in depth before agreeing that Cassel could recuse herself “where her outside board service would be construed as an actual or perceived conflict of interest.” So far that hasn’t happened, Greiner said. Two ethics experts interviewed by ProPublica said Cassel’s relationships with Kaiser and Premier present obvious conflicts given the Quality Forum’s broad involvement in health care. The Quality Forum maintains a clearinghouse of more than 700 quality measures — covering everything from tracking hospital readmissions to setting information technology standards — that are established by expert committees and widely adopted by U.S. hospitals and other providers. The ethics experts said they were uncertain how Cassel could recuse herself to anything related to Kaiser and Premier and still do her job. “Would that mean every time somebody said the word ‘hospital’ she would have to say, ‘I can’t be in this conversation?’” said Eric Campbell, a Harvard School of Medicine professor who has published extensively on conflicts of interest. Campbell and Krimsky said the cleanest way to eliminate potential conflicts would be for Cassel to resign from the outside boards. Campbell also said Cassel could continue serve but without pay, which would at least remove possible concerns about the influence of money. No one has suggested that Cassel has used her post to benefit Kaiser or Premier. But the disclosure of her outside compensation comes as quality is increasingly becoming a bottom-line issue for the industry. Not so long ago, hospitals and other medical providers were paid the same fees by Medicare and other payers based on services they provided, regardless of whether outcomes were good or bad for patients. But as medical errors continued to cause harm and drive up costs, the federal government and others began experimenting with ways to link payments to performance. That’s where the Quality Forum’s endorsements come in. Established in 1999, the Washington, D.C., nonprofit invites hundreds of participants from across the health care spectrum — insurers, practitioners, researchers, health care systems and consumer groups — to become members and help pick the best quality benchmarks for endorsement by consensus. Kaiser and Premier are among the group’s 375 dues-paying member organizations. In 2009, Medicare awarded a $40 million contract to the Quality Forum to recommend measures it could adopt. President Obama’s health care reform law accelerated the move to pay-for-performance. Medicare already has begun penalizing and rewarding hospitals based on readmission rates, mortality and patient satisfaction measures. By 2017, it’s expected that 9 percent of Medicare payments will be based on performance. Much of the Quality Forum’s work has been behind the scenes. But that changed last month when allegations arose that questioned the group’s vulnerability to commercial influence. In settling federal whistleblower lawsuit, the Justice Department accused a well-known patient safety leader, Dr. Chuck Denham, of accepting $11.6 million in kickbacks from a drug company while he co-chaired a Quality Forum committee to endorse patient safety measures. Denham said he had legitimate contracts with the drug company, but the payments were not disclosed to the Quality Forum. ProPublica found that the group’s final 2010 Safe Practices report endorsed the company’s surgical antiseptic, a decision that other committee members said was unintended. In response to the Denham case, the Quality Forum launched a review of the committee’s work and the organization’s conflict-of-interest policies. The review is expected to be complete by Feb. 25. Cassel’s outside board positions create conflicts, according to ethics experts, because Kaiser and Premier could be affected by Quality Forum endorsements. Kaiser, an integrated system that’s been touted as modeling the future of health care, had hospital revenue of $18 billion and health insurance plan revenue of $37 billion in 2011. The organization operates in eight states and the District of Columbia at 37 hospitals and hundreds of medical buildings. Kaiser spent $1.6 million lobbying Congress, the Department of Health & Human Services and other agencies last year, according to the website OpenSecrets.org. A Kaiser executive, Jack Cochran, sits on the Quality Forum’s board. In an email, Kaiser spokesman John Nelson said the health system was “incredibly fortunate” to have Cassel on its board for the past decade and that “any organization smart enough to engage with her will receive wise counsel and honorable service." Premier reported revenues of $869 million in the fiscal year ending last June. It spent more than $1 million on lobbying in 2013, according to OpenSecrets.org. In August and November, the company urged members of Congress to instruct Medicare to run any quality measures through the Quality Forum. Childs said Cassel’s role on the Premier board doesn’t pose any conflict of interest, and that her relationship with Premier was vetted carefully by the Quality Forum’s board. Cassel was a good addition to the Premier board because of her commitment to improved care and lower costs, he said. Harvard’s Campbell said Cassel’s dual roles aren’t necessarily a problem if disclosed and carefully managed. But he offered a baseball analogy to show why they present a risk for the Quality Forum. Imagine, Campbell said, training umpires to call balls and strikes — except the person doing the training is also being paid by the New York Yankees, and the strike zone favors the swing of Derek Jeter. Campbell said he wasn’t being judgmental about Cassel’s conflicts of interest. But the Quality Forum is paid taxpayer dollars by Medicare to perform a public service in a quasi-regulatory role, he said. When the Quality Forum’s leader is paid hundreds of thousands of dollars by hospital companies, Campbell said, it creates a potential incentive to shape the rules in their favor. Krimsky, the Tufts ethics expert, was more critical of the arrangement. He said it’s not enough for Cassel to recuse herself from decisions or discussions related directly to Kaiser and Premier. She still could be involved in choosing who sits at the table to have discussions or make decisions, he said. “When there’s a conflict of interest in the management group, that’s a serious problem,” Krimsky said. Dr. Peter Pronovost, a well-known patient safety leader from Johns Hopkins Medicine, said he did not see how Cassel’s outside board roles would present a direct advantage for Kaiser and Premier. But he said conflicts of interest in the world of quality improvement are often indirect, and the industry hasn’t clearly defined how to navigate them. Although Cassel’s relationships were known to the board, it does not appear that they were widely shared with the Quality Forum’s membership. Cassel’s biography on the Quality Forum website mentions about a dozen other affiliations but not Kaiser and Premier. Some who are active on Quality Forum committees also said they were unaware. Leah Binder, president and CEO of The Leapfrog Group, a coalition of employers that advocates for quality and transparency in health care, said she respects Cassel but would have liked to have known about her outside board roles. Lisa McGiffert, director of the Consumers Union Safe Patient Project, sits on a committee that’s recommending possible pay-for-performance metrics to Medicare. Recently a debate about a proposed hospital readmission measure pitted the consumer-minded members, who favored it, against the providers, who were against it. In the end, the consumer side didn’t get its way, she said. McGiffert said all Quality Forum conflict-of-interest disclosure forms should be posted online so anyone can easily see various allegiances. Rosemary Gibson, an author and senior adviser to The Hastings Center, a research group dedicated to bioethics in the public interest, said she wasn’t surprised at Cassel’s outside compensation. So much money permeates decision-making in Washington, she said, that participants have become oblivious.